Woolf Works was a surprise. A three-act story ballet inspired by classic literature — nothing in that description would lead you to think of Wayne McGregor as its choreographer. He has worked mostly without narrative, often drawing on ideas from science: atomic behaviour, neurological systems, physiology. A certain geekiness of attitude is echoed in his style, which tends toward hypermobility and hyperactivity, with a degree of control-freakery. He’ll have his dancers flash past with limbs splayed as the spine wriggles and a hip juts, while a cricked neck or a crooked finger is set just so. Add to this a penchant for video, lighting effects and bold stage designs, and you get works that thrive on physical stimulus and abstract ideas, sustained through a single act; you don’t get overt characters and stories. Indeed, McGregor’s only explicitly narrative work — Raven Girl, from 2013 — was a fine-looking piece that failed to connect with its story. Yet here was the Royal Ballet, where McGregor has been resident choreographer since 2006, commissioning a full-evening ballet from him, based on quintessentially literary novels by Virginia Woolf. And the big surprise? That it worked so well. 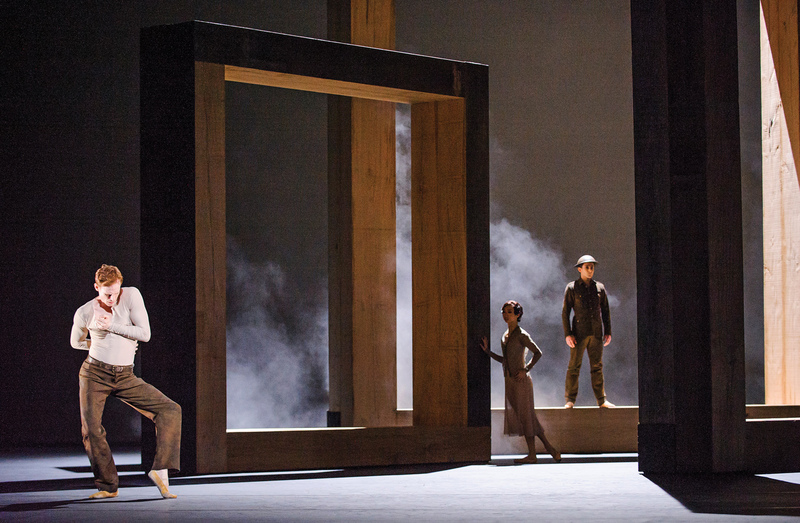 Woolf Works, which premiered at London’s Royal Opera House in May, has extended McGregor’s range, and though not without flaws, it is also a ballet of subtle sentiment and considerable poetic beauty. Though based on novels (Mrs Dalloway, Orlando and The Waves, one for each act), its approach is poetic rather than novelistic; mood, composition and imagery speak louder than story and sequence. The opening act, I Now, I Then, comes closest to a kind of drama, but it is the framing, not the details of action and consequence, that stirs up the imagination. The act begins with words projected onto a scrim, behind which appears the figure of veteran dancer Alessandra Ferri as the text dissolves into a snow of abstract shapes swirling over her body – the first of many poetic images. Ferri, now 52, plays Clarissa Dalloway with lyrical gravitas (each bend and gesture suggests a personal history contained within it), with Francesca Hayward as her younger, fresher self. Gary Avis is her attentive husband, Federico Bonelli and YasmineNaghdi are former lovers, and Edward Watson is marvellous as a shell-shocked soldier, his articulate body expressing all that his character cannot: a broken psyche, a self that cannot support itself. Yet the characters are almost not the main point. Black-and-white film footage of London streets locate the action in history, in memory, while Max Richter’s score mixes music with the noise of traffic and the tolling of bells, and huge wooden squares rotate onstage like giant tilting window frames. Here lies the heart of this episode: the framing and enfolding of times and perspectives, the dancers circling each other so that we sense them not only as bodies and characters, but as fugitive temporal clusters of dreams and memories. Act 2, Becomings, is more familiar McGregor territory, crammed with detail and big on effect: laser lights strafing the audience, billows of smoke, unisex costumes of gold ruffs, cut-off bodices, knickers and knickerbockers. It can be relentless and sometimes merely flashy, yet you sense its arc, its sweep. The music is a phased collage of overlapping fragments, and the dance passes by as a rush of disjointed solos, couples and groups emerging from and falling back into the darkness, like so many torn pages flung into the wind. Against which one remarkable duet stands out: a slow, contortionist coupling of snakelike suppleness and steely strength that sits at front-centre stage, as if suspended in time. The final act, Tuesday, is the most purely poetic. There are glimmers of story — a voiceover of Woolf’s suicide letter, remembered scenes of children at play — but, again, the act is underpinned by one overwhelming image: the older woman and the sea. Ferri is the woman — in motion, exquisitely composed, but disquieted by emotional undercurrents — and the sea appears behind her, first as a vast projection of slate-grey ocean, then as a corps de ballet of living bodies that evoke the tug of tides, the surge and splash and submersion of waves as Ferri surrenders herself to them, her body drowned by theirs. The video of the ocean, initially a still image, has slowly but inexorably accelerated throughout the act until now, as Ferri expires, the sea’s heaving flanks seem finally to be breathing normally. Poetry, again. A compositional arc.Overt human emotion. Lyric beauty. Not typical McGregor qualities, but here they all are. I imagine that dramaturg Uzma Hameed, a theatre director and Woolf specialist with a dance background, influenced the poetry and composition, and Ferri — too old for McGregor’s more characteristic physical virtuosity, but a very compelling dancer with her own body of experience — helped bring out the beauty and emotion. The piece can teeter toward cliché, and Richter’s music sometimes slaps on the sentiment too thickly (after the first few big, swelling crescendos, you start feeling more manipulated than moved); nevertheless, Woolf Works stands as a very fine achievement, and a wonderful surprise.